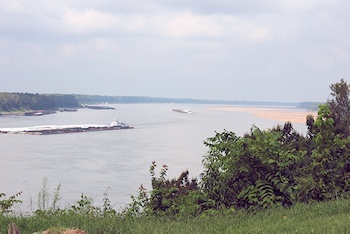 As long as the United States has been in existence, the Mississippi River has been the most important and strategic waterway in North America. Even before the early settlers arrived, Native Americans knew the importance of the great river. Columbus, Kentucky was the first town settled in far western Kentucky, known as Jackson’s Purchase. It was originally authorized by the Virginian legislature (before Kentucky was a state) in 1784. However, only the corners were set of the town’s layout due to attacks by the Chickasaw Indians. Decades would pass before further attempts were made at settling the area. When Andrew Jackson purchased all the land between the Mississippi and Tennessee Rivers, another attempt was made around 1820 to settle Columbus. This time, it was successful. Belmont, Missouri elevator, across the river from Columbus. Courtesy CBSP. Click for larger photo. The city occupied 4,000 acres and contained space for a public square, educational buildings, businesses, homes and a town cemetery. Columbus was the first county seat of Hickman County, which at the time included all of western Kentucky from the Mississippi to the Tennessee River. Columbus quickly prospered since it was a major transportation hub on the Mississippi River. It served as a port city for the majority of people living in far western Kentucky. 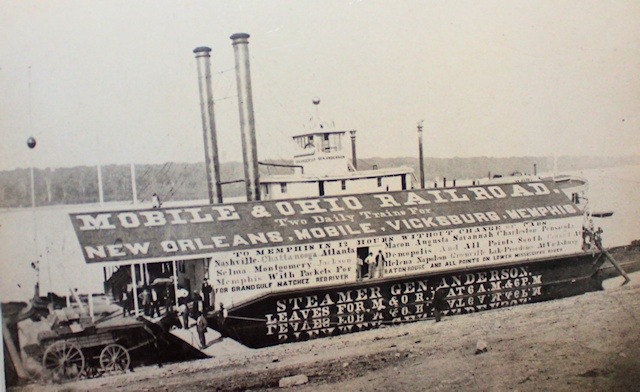 And then, on April 22, 1861, just a mere six months before Columbus would be occupied by Union forces, the Mobile & Ohio Railroad arrived. The Mobile & Ohio had been heading north from Mobile, Alabama for the past decade. Railroad officials desired to tap into the river trade from the Ohio and Mississippi Rivers. They determined that most of the freight they would be hauling would come from St. Louis. River steamers would be used to haul the freight cars from their terminus up to Cairo, Illinois to connect with the Illinois Central Railroad. But perhaps more appealing would be the St. Louis & Iron Mountain’s southern terminus at Belmont, Missouri, which was 800 yards from the Columbus terminus of the M&O and was expected to be completed in 1861. Columbus was about to come a major rail hub. 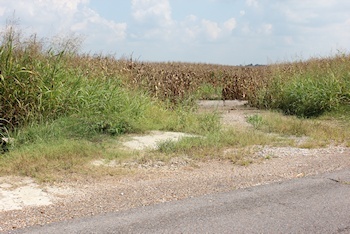 Present-day Kentucky 123 south of Columbus where the Mobile & Ohio crossed the road. Camera is shooting down the old right-of-way southward. Just six months after the arrival of the railroad, the Union forces attacked Belmont but were pushed back after a day-long battle on November 7, 1861. The Confederacy control Belmont and neighboring Columbus until March of 1862. The South had to abandon their fort due to the Union armies seizing Fort Henry and Fort Donelson. The North took control of the fort, Columbus, Belmont and effectively the railroad operations. The Mobile & Ohio Railroad suffered extensive damage during the Civil War. According to an annual report by the railroad in 1866, the line was totally destroyed for 184 miles between Union City, Tennessee and Okolona, Mississippi. The bridges, depots, trestles and shops were destroyed. Even the rails were bent and deemed unusable by the Union forces. At Mobile, most of the rolling stock and engines were destroyed. The line was also several million dollars in debt ($5.2 million in confederate currency – translated into over $8 billion in today’s dollars). The railroad eventually was rebuilt but struggled financially. The old port at Columbus advertising the Mobile & Ohio Railroad. Courtesy CBSP. The M&O originally planned to extend their line from Columbus to Cairo. Issues prevented them from doing so until December 1, 1881 the line was extended to Cairo. The St. Louis & Iron Mountain Railroad was delayed and their southern terminus at Belmont finally opened on August 14, 1869, eight years after the M&O arrived at Columbus. This mean Columbus was a main rail hub from 1871 to 1882, the year the line was extended to Cairo. In fact, up to 100 railcars were transferred each day at Columbus. But when the line to Cairo opened, transferring cars on steamers from Columbus to Belmont was no longer economically feasible. And after an 1886 acquisition of the St. Louis & Cairo Railroad, the terminal at Columbus became irrelevant to the Mobile & Ohio Railroad. Columbus continued to see rail operations, however, with the Nashville, Chattanooga & St. Louis Railroad shipping freight through there. This continued on until 1911 when the Iron Mountain Railroad abandoned the ferry due to severe damage caused by flooding of the river. 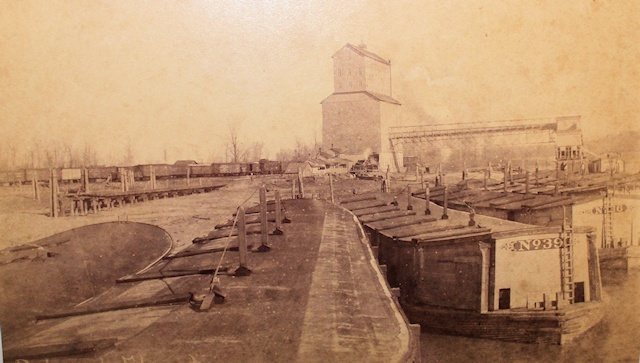 The final blow came during the flood of 1927 when the Columbus depot was under 8 feet of water. The town relocated to the bluff above and 1.6 miles of the railroad between the main line at South Columbus and the river was officially abandoned on March 19, 1928. Railroad legend Casey Jones got his first job in Columbus, Kentucky in 1878 at the Mobile & Ohio Railroad. Casey was legendary for several reasons, but his trademark heroic effort came in early 1900. He was driving a passenger train in Mississippi when we noticed a stalled freight train ahead. He told his fireman to jump, but Casey stayed on board attempting to slow the train down. Reportedly, he got the train down from 75 mph to 35 mph before smashing into the back of the freight train. He was killed, but no one else on his passenger train perished.